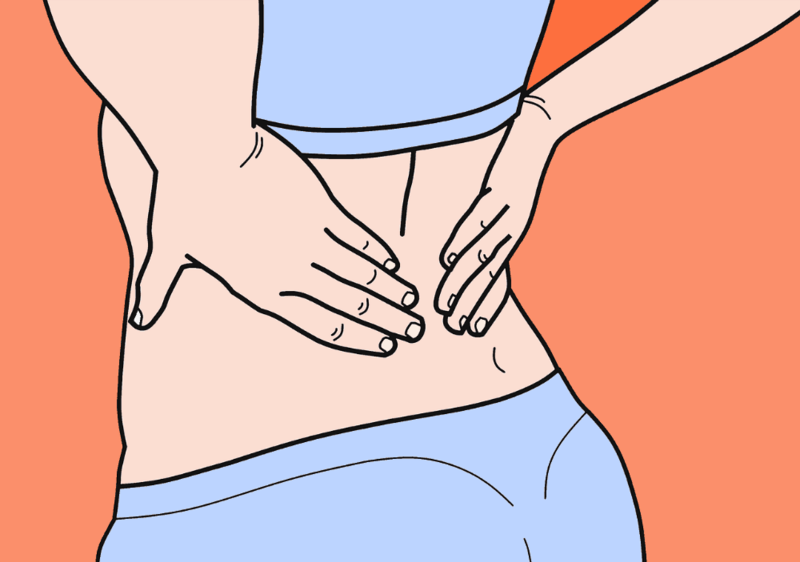 Does IBS Cause Lower Back Pain? In my practice, clients with a primary presenting symptom of lower back pain often also report having irritable bowel syndrome (IBS) symptoms such as bloating, constipation, diarrhoea and gas. To the client, these two conditions appear unrelated. But are they? Does IBS cause lower back pain? Research has found that IBS is associated unrelated extra-intestinal symptoms including Chronic Fatigue Syndrome, depression and Fibromyalgia. Association of symptoms means that they usually appear together. It does not mean that one condition may cause the other. For example, just because many of my clients with lower back pain also have IBS does not mean that the latter caused the former. To say that one condition causes another you would have to observe that by treating one the other also resolves. In this article, I will outline a client case study whose back pain and IBS symptoms resolved on a low FODMAP diet. Kelly 35, is a yoga teacher working in downtown Ottawa. While participating in a yoga class, I was also attending I noticed that she avoided doing any postures that involved twisting. After the class, I asked whether Kelly suffered from lower back pain. Kelly explained that the pain had started some four weeks previously. She had been receiving chiropractic care with a limited reduction in symptoms. I indicated that if physical symptoms do not respond to physical therapy, then there is often an underlying condition that is driving the problem. I suggested that she come for a consultation with me so that I could assess her back pain and what might be causing it. A week later she came for an initial consultation, and I took a full medical history. As well as suffering from the lower back pain she also complained of digestive symptoms including abdominal discomfort, bloating, diarrhoea and gas. She had experienced these symptoms since she was a teenager. She had tried removing gluten from her diet to help her symptoms (which it did) but said that it was socially too stressful to maintain the diet. On examination, I identified that her muscles were hypertonic or tight and a couple of the primary muscles that support her lower back were not functioning very well. I explained to Kelly that in my experience over tight and poorly functioning muscles are often a cause and sign of low-grade inflammation. Furthermore, this inflammation often stems from problems in your digestion. Some years previously Kelly was referred by her family to a Gastroenterologist about her digestive symptoms and was diagnosed as having IBS. Recent research has found that approximately 80% of people with IBS have a condition called Small Intestinal Bacterial Overgrowth or SIBO. SIBO is a condition where your friendly bacteria that normally live in your large bowel overgrow into your small intestine. One of the functions of the friendly bacteria is to breakdown fermentable carbohydrates known as FODMAPs. When this process occurs in the small bowel, it can lead to a build of gases causing the symptoms of bloating, constipation and diarrhoea but also inflammation that can spread throughout the body. Research has also shown that a low FODMAP diet can help reduce symptoms of IBS. With this information in mind, I explained to Kelly that I thought that her poor digestive health might be causing her back pain and suggested that she try following a low FODMAP diet for two weeks. Due to her experience of following diets, she was a little anxious but said she would think about it. I said that was, of course, her decision and to do what she could manage without getting too stressed. Two weeks later at our follow up appointment she said that on reflection she had decided to embrace the diet fully. Furthermore, she reported significant improvement in both her digestive symptoms and lower back pain. Interestingly she noticed that when on one occasion she veered away from the diet she observed the following day her lower back symptoms were worse. Based on the clinical outcome, we could assume that Kelly’s back pain was the result of her IBS. Can we expect that everyone with lower back pain and IBS will have the same outcome? The answer, of course, is no. To make that conclusion we would have to carry out a much larger study. That being said changing one’s diet is a relatively low-risk therapeutic intervention compared to for example long-term use of anti-inflammatory medication. If you do suffer from lower back pain that has not responded to physical treatment and at the same time suffer with IBS symptoms following a 2-week low Fodmap diet would be a safe option. Now I’d like to hear from you. Do you suffer from lower back pain and IBS? Have you tried a low FODMAP diet? Let us know in the comments below.